EVERY TUESDAY (subject to occasional closures by venue). Upstairs to the 229 bar for social drinks: 22:30 till late - optional. Payments are cash only at this venue. Available on first night only before 10pm - pay for 3 classes and get voucher for entry to 6. 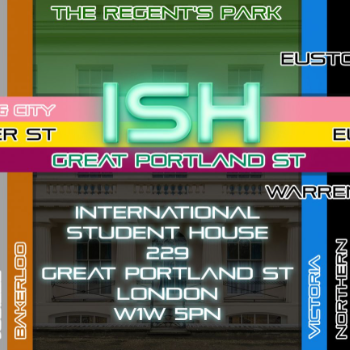 Join us on Tuesdays for our dance classes at Ceroc ISH and learn to dance at London's 'International Students House' by Great Portland Street in the heart of the West End. This recently refurbished venue offers everything that we require for a great Ceroc night in a neat subterranean environment. This venue boasts a superb sprung wooden dance floor plus air conditioning and a huge stage as well as a professional in house sound system and atmospheric lighting to create the perfect ambience for dancing. This is the place to be seen on a Tuesday in London. The AC will keep you cool as you mix and mingle with some of the best dancers in the city, stopping only to get a drink from the bar. New members are welcome every week. No need to book. Just turn up, complete a membership form and join in the class. We run beginners classes every week and have experienced dancers dedicated to making your first few Ceroc experiences enjoyable and relaxing. Great Portland Street (Circle, Metropolitan, H&C lines). This station is on a little island so choose any exit at street level and walk round the outside until you see Pizza Express across the road with '229 International Student House' next to it on the right. Cross the road and Ceroc is through the entrance to the left of the main reception doors of International Student House. Other nearby Tube stations: Euston Square, Baker Street, Oxford Circus & Goodge Street all about half a mile distance. All three stations are a short bus ride away. Euston is easily walkable about half a mile away. C2, 18, 27, 30, 88, 205 and 453 (all stop nearby).